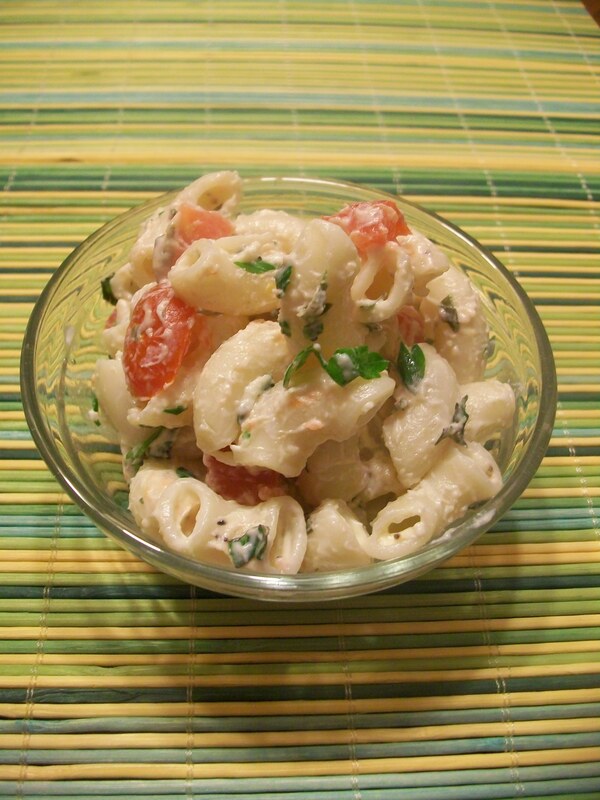 This recipe is a nice, simple (and lighter) change-up from your typical macaroni salad laden with mayonnaise and egg. I have made this a few different ways and here are my favorite variations for awesome flavor additions (or use them all in one awesome salad! ): 1/2 cup finely grated Parmesan cheese; 1-2 small zucchini squash, diced, seasoned and grilled or sautéed to al dente; 1 finely diced shallot. Cook, drain and cool your pasta. Be sure to salt the water before adding your pasta! After removing pasta from heat, place in colander and put about 3 cups of ice on top, then rinse with cold water. This is an important step in making a macaroni salad – hot pasta continues to cook itself, so ice and cold water will stop the process. In a separate bowl, mix all other ingredients together except tomato (mayo, sour cream, oil, herbs and spices). When well combined, mix the macaroni and mayo mixture together. Last, very gently fold in the tomatoes. Refrigerate until cool. Serve – enjoy! Tags: basil, food, garden fresh recipes, garden fresh salad recipes, herb, hot weather recipes, light, light macaroni salad recipes, macaroni salad, macaroni salad recipe with sour cream, macaroni salad with basil, macaroni salad with fresh tomatoes, macaroni salad with zucchini, macaroni salad without mayo, macaroni salad without mayonaise, pasta salad recipes, pasta salad with basil, pasta salad with tomatoes, pasta salad with zuccini, picnic favorites, recipes, seasoning pasta water, sour cream in macaroni salad, tomato, vegetarian. Bookmark the permalink.